JINAN, East China, Oct. 26 (Xinhua) -- Li Yanxi of Hebei broke the oldest Chinese track field national record as she rewrote the men's 28-year-old triple jump record with 17.59 meters at the 11th Chinese National Games here on Monday. The 25-year-old Li, the 2006 Asian Games champion in Doha, also broke the Asian record of 17.35 set by Kazakhstan's Oleg Sakirkin in 1994. The national mark of 17.34 was set by legendary Zou Zhenxian at the 3rd Athletics World Cup in Rome in 1981. 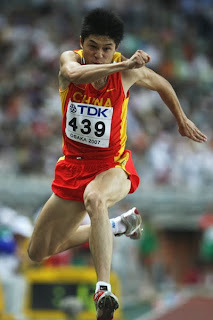 Only several minutes after Li's jump, Zhu Shujing from Zhejiang also broke the two records with 17.41 meters. The new mark of the event made the previous record holder Zou the happiest man. "I have been waiting for this day for 28 years. Chinese triple jump is really promising in the future," Zou said, who watched the competition in the Jinan Olympic Sports Center. Zou launched an annual national competition as early as in 1997 to challenge his triple jump record. However, the record remained unchanged until this National Games. Li's 17.59-meter record was equal to Bahamian's third-place result at the Beijing Olympics.